There's something I've been dreaming of for the past 10+ years. Something that doesn't cost much. Something I am truly hoping will come to fruition this spring. Is this the year?!? What do you think it could be, this dream of mine? If you guessed number 5 you'd be right! Now you really think I'm a freak! And I'm not going to say you're wrong. I've been begging Paul for a chicken coop for the past 10+ years. I love the idea of having my own fresh eggs. And having chickens running around the place. 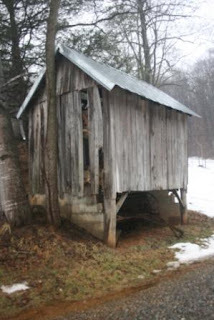 I'm kind of hoping if I blog it, Paul will build it, and the chickens will come. Do you think I could be that lucky? I'll let you know. 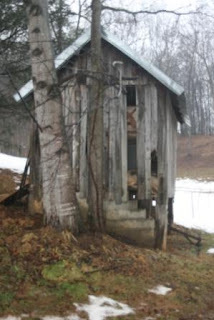 This is the last original building on our land aside from the barn. It's an old smokehouse. We used to have quite a few of these little sheds around, but we tore them down as they were in such bad shape. 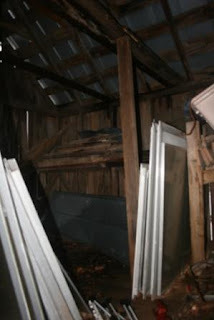 Now, the barn is in terrible condition, and we hope to eventually tear it down and rebuild (in a different location). In the future, I will scan some pics of the old homestead buildings to show you. 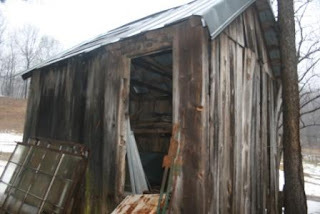 But for now, this little shed is the only building that could possibly be a hold out. I'd like to hang on to this small bit of history. It definitely needs some work. The floor is rotting, the roof is bad, you can see the holes in it. But how perfect would it be as a chicken coop? Yup, it needs a good cleaning out to be sure. Just for starters. I like chickens. I hope one day we can provide a nice home for some. Is there something relatively inexpensive that you've been dreaming of for over 10 years? For years, I have been on a quest for the perfect Bible. Now you know for a fact, I have at least 10 personal Bibles that I have bought over the years. I have to try out every new translation that comes along. The older I get, the larger the print needs to be. I have a couple of study Bibles that include wonderful information without my having to look it up. But I would love a Bible that has it all. It would be King James Version, because the beauty of the language in that version appeals to me more than any other. The cover would be genuine leather,very high quality in a lovely color. It would have to be thumb-indexed with Christ's words in red letters. Large print. And a nice size and weight for carrying to church. There should be space somewhere to write notes and a concordance with maps in the back. Whenever I am in a Christian bookstore, I go through all the Bibles and I have never found the perfect one. Sometimes, it isn't the right size. Lots of times, it isn't thumb-indexed. Or the leather isn't scrumptious enough or the color is all wrong. But I know it is out there somewhere and one day I will crack it open. :-) I would never buy a Bible online. I have to see it and hold it first. So that's my personal chicken coop.